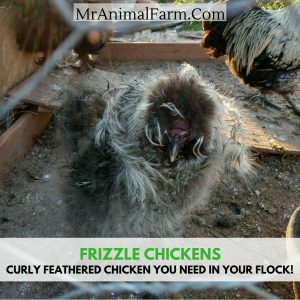 Frizzle Chicken - Curly Feathered Chicken You NEED in Your Flock! 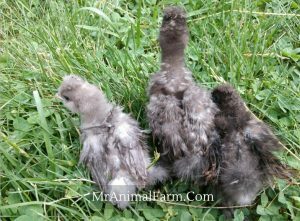 Frizzle Chicken – Curly Feathered Chicken You NEED in Your Flock! Frizzle Chicken. The very first time I heard this bit of chicken terminology, I thought what the heck is a frizzle chicken?? 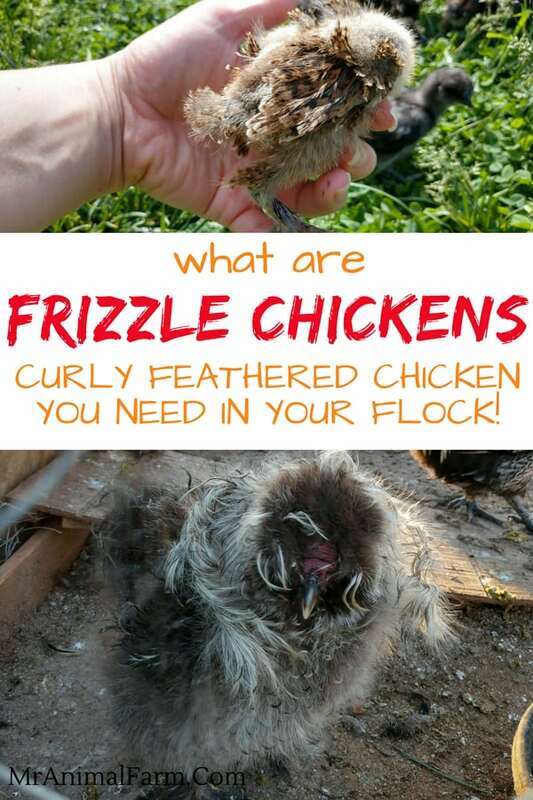 To explain what a frizzled chicken is in a simple way, they are a curly feathered chicken. A frizzle itself is not a specific chicken breed though. There are several breeds that can be a frizzle chicken. Frizzle cochin, polish frizzle chicken and frizzle silkie (also known as a sizzle) are just a few examples. So, if a frizzle is not a specific breed, what exactly causes a chicken to be a frizzle? A frizzle is a chicken which does not have “standard” or “normal” feathers. Instead of it’s feathers laying flat, they curl up and out from their body. This frizzling, so to speak, is caused by an incomplete dominate gene. This means that a chicken only needs to carry one copy of the frizzle gene in order to show frizzling. Some birds will show more frizzling than others. This is due to the fact that the frizzle gene also has a modifying factor to the gene which can control the extent to which their feathers will appear frizzled (source). A frizzle chicken will tend to have most of the same characteristics of the actual breed that it is. 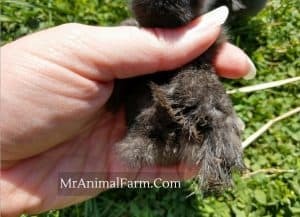 For example a frizzle silkie will tend to have the same black skin, 5 toes and friendly personality of a typical silkie chicken. The main difference or defining characteristic of a frizzle chicken is, of course, its curly or frizzled feathers. Many chicken breeds already have a frizzle version of their breed. As already mentioned, some of the most common frizzle chicken breeds are: Frizzle cochin, Polish frizzle chicken and frizzle silkie. Cochin and Polish come in frizzle standard and frizzle bantam. Silkies are a bantam breed and do not have a standard size in general. Bantam breeds are basically “mini” size chickens. 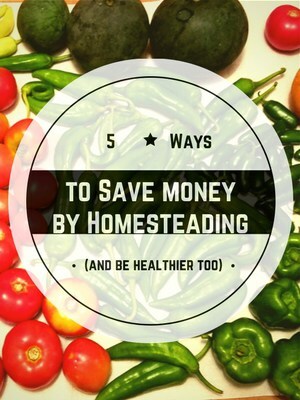 Taking care of a frizzled chicken is pretty similar to taking care of a “regular” chicken. However, there are some important points to consider. Due to the fact that they do not have “normal” feathers, it can make them a little different to care for. First, due to being a frizzle, they cannot really fly. Their feathers are not made the same and therefore, do not have the same characteristics allowing them flight. This means that they may need a shorter perch. Also, they may not be as well equipped to get away from predators – so they may do better in a predator proof run than being free ranged. Second, since their feathers are curled and not “standard”, they do not have quite the same insulation as normal feathered chickens. We have frizzled chickens in our flocks here in Virginia and they seem to do just fine in the cold and snow of winter. However, we do make sure that they have a very cozy, draft free chicken coop with lots of buddies to pile up with and stay warm. Our frizzles (like our silkies) will tend to all pile up together for warmth, especially when it is cold out. Breeding frizzle chickens is really quite fun. They are such a unique looking chicken with their curly feathers. 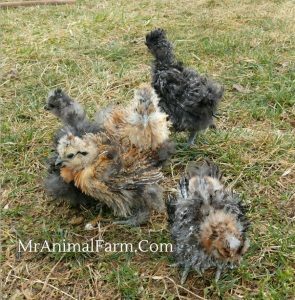 When you breed frizzled chickens, you never want to breed two frizzle chickens together. The result of breeding frizzle to frizzle can result in a double frizzle chicken – meaning they have two copies of the frizzling gene. We call these frazzles. Frazzles do not often live very long or healthy lives. Having two copies of the frizzle gene makes their curled feathers very brittle. 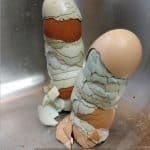 They tend to break off. They are often times bald in places. And their overall health tends to suffer. Due to this, we recommend setting up breeding pens where you either have a frizzle rooster over normal/standard feather hens. Or, you can set up your breeding pens to have a normal/standard feather rooster over frizzled hens. If you breed Frizzle to Normal/standard it will result in 50% frizzled and 50% normal/standard feathered chicks. Whereas, if you breed Frizzle to Frizzle will result in 50% frizzle, 25% normal/standard, 25% frazzled feathered chicks. When frizzle chicks hatch, you cannot really tell that they have a different feather type. 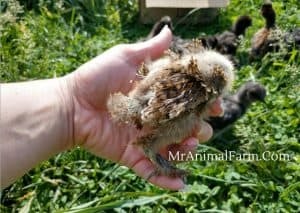 It is not until they are a few weeks old and have started blowing their chick fluff that you will start to see if they have feathers that have a curl. If you are looking for a frizzle chicken, a few of our silkie colors have the potential to have frizzled feathers. Our mottled, crele and silver patterned pens all have the chance at having frizzled chicks. 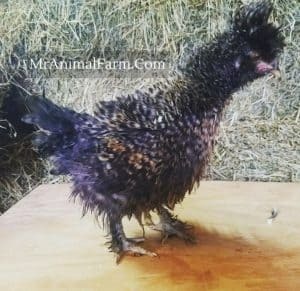 Overall, if you are looking for a fun, unique addition to your flock, adding a frizzle chicken is a good choice. 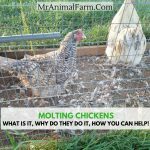 Most frizzled chickens make great pets as most of the frizzle chicken breeds are also friendly.